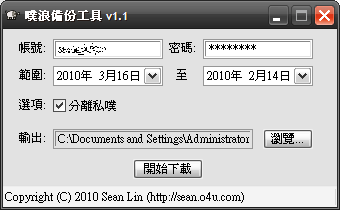 它只會由 01-10-2009 下載 plurk 留意到 30-10-2009. 31-10-2009 的留言會被減去. 如要下載 31-10-2009 的留言, 就要把日期改為 01-11-2009. 是否 AND / OR 的 function 出了問題??? 不過你要在 Liunx 上要把 Win32::GUI 改掉! Sorry it's not convenient for me to write in Chinese. But is it possible to make an executable that works for Mac OS? 請問，我試了很多次，都是備份到一半就跳出一個訊息~「500 read failed : Unknown error at PlurkBackup.pl line 269」然後就停止備份了，請問這種狀況可能是出了什麼問題呢? 這正是這兩天我想要找的東東, 太棒了, 這樣plurk就真的可以作online logbook, 並且可以下載存檔了.